Diamond Dragon Online Slot is a 5 reel, 50 payline slot game powered by Rival Gaming. 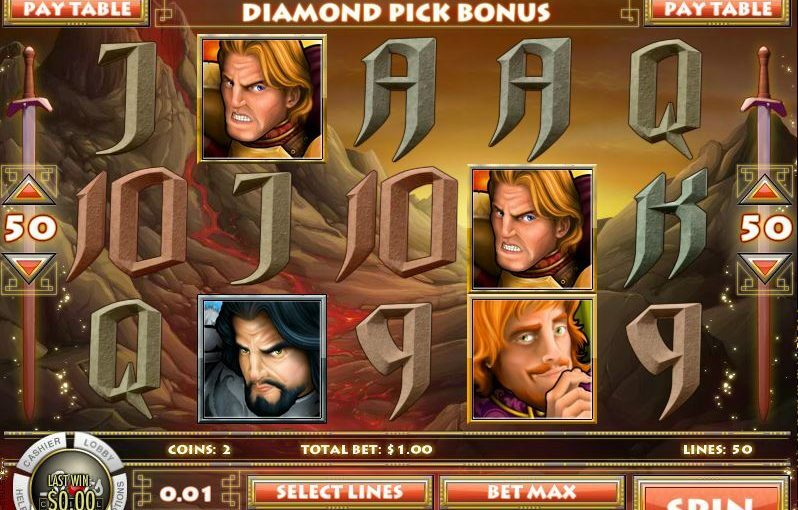 Feuding families battle to control the Diamond Dragon, and the treasure it guards, in Rival’s latest 5-Reel slot. The Northern Prince, Golden King, Shifty Baron, and Desert Queen are all vying for power. The Dragon’s treasure consists of Golden Chalices, Magic Vials, and Diamonds. The last of the icons represented include 9, 10, Jack, Queen, King, and Ace. The Dragon icon is an Expanding Wild! Pick a diamond to win coins when three Diamond Bonus icons appear onscreen. Three or more Golden Axe icons triggers the Free Spin Round. During Free Spins, three or more Silver Axe icons triggers the Super Round!